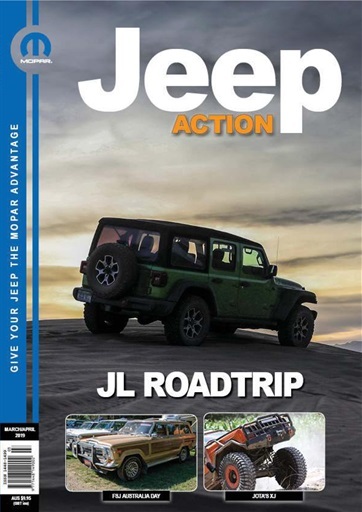 (0 Customer Reviews) | Write Review 6 issues per year Jeep Action Magazine is a bi-monthly magazine for four-wheel drive enthusiasts and in particular, Jeep owners and prospective owners. It features articles on Jeep activities in Australia and from around the world. The magazine is an information resource for Jeep enthusiasts seeking parts, products and services for their vehicles and off-road adventures. Jeep Action Magazine is printed on gloss paper in full colour and is the only Jeep magazine published in Australia. Jeep Action features articles on Jeep history, owner profiles, trips, technical, Jeep builds, modifications and events. Jeep Action Magazine is a bi-monthly magazine for four-wheel drive enthusiasts and in particular, Jeep owners and prospective owners. It features articles on Jeep activities in Australia and from around the world. The magazine is an information resource for Jeep enthusiasts seeking parts, products and services for their vehicles and off-road adventures. Jeep Action Magazine is printed on gloss paper in full colour and is the only Jeep magazine published in Australia. Jeep Action features articles on Jeep history, owner profiles, trips, technical, Jeep builds, modifications and events. You'll receive 6 issues during a 1 year Jeep Action magazine subscription. You'll receive 6 issues during a 1 year Jeep Action magazine print subscription.